Traffic of protected tortoises, two court decisions condemning the illegal trade! The illegal trade in tortoises is considered one of the main causes of their disappearance with the fragmentation and loss of habitat. These judgments are useful to understand that such behavior will not go unpunished and that these species should be considered as a source of juicy profits... (Source: FNE). 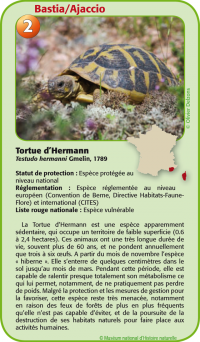 The LIFE project ‘Tortue d’Hermann’ will be holding an international workshop on management and restoration of habitats for Hermann’s tortoises at Communauté de Communes Coeur du Var in Le Luc-en-Provence, on 18-20 September, 2013. The workshop is open to naturalists, biologists and researchers, as well as field participants, land managers and coordinators of centres devoted to the protection this tortoise. The aim is to bring together such experts and stakeholders order to benefit from their respective experience in the area of conservation of this species. It will offer an opportunity to report on the latest scientific knowledge, compare management strategies, propose ways of protecting habitat in the coming years and create an active network of experts and partners. A pdf containing further information about the workshop, can be downloaded here. 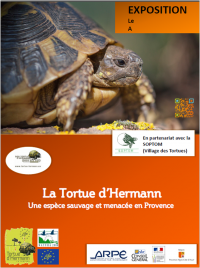 The educational exhibition "Hermann’s tortoise, a wild and endangered species in Provence" developed as part of the Life program by SOPTOM will be visible in 2013 in various public places in the Provence-Alpes-Cote d’Azur do not hesitate to consult it! 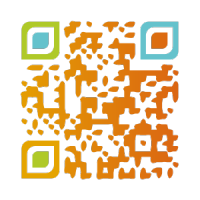 To find out where and when you can see it, click below! Médiathèque of Cannet des Maures (83). This educational exhibition is accompanied by a photographic exhibition. Conservatoire du Freinet of La Garde Freinet (83) with an evening conference March 30 to 17h. Parc Saint-Mitre for the Nature festival ofAix-en-Provence (13). In the context of the 100th Tour de France, the National Museum of Natural History and IGN have produced a map of protected areas of metropolitan France. 21 species corresponding to 21 stages of the Tour 2013 edition are presented. For Step 2: Bastia> Ajaccio June 30: presentation of the Hermann’s tortoise localized on the day’s stage. Forestry work to improve the habitat of the Hermann’s tortoise in communal forest Vidauban (Bois du Rouquan) are completed. These management actions habitat consisted of habitat opening interventions through scrub brush and cuts from pine plantations. ► protection of flow zones by geotextile and spreading branches from the tree tops. The result of these interventions is a real success in terms of environmental impact reduction while nearly 3700 trees were cut and removed (more than 200 cubic meters in total). The western subspecies of Hermann’s Tortoise: Testudo hermanni ssp. hermanni (France, Italy, Spain) is on the Red List of Threatened species with the status "endangered". New photos in the library! Check out the gallery of photographs by Joseph CELSE on the Hermann’s tortoise. New press article about the Hermann’s Tortoise Life+ program and collaboration between the project partners: SOPTOM and ONCFS. 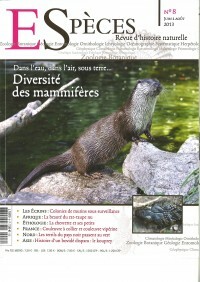 The article entitled "A new species of field naturalists" is to be found in the Journal ESPECES, June 2013 (ESPECES No. 8): www.especes.org. 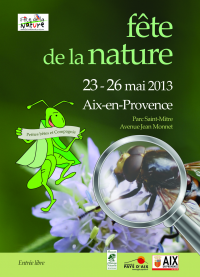 Nature Festival in Aix-en-Provence: The Life project successfully represented! The results of three days of attendance at the stand of Life program at the Nature Festival of Aix is very positive: nearly 600 school sensitized on Thursday 23 and Friday May 24 and more than 500 people of all ages Saturday, May 25. From 23 to 25 May 2013, the Hermann’s tortoise was represented at the 2013 edition of the nature festival in Aix-en-Provence (Park St. Mitre), whose theme this year was "Little Beasts & Company." Visitors were able to see the exhibition "The Hermann’s tortoise, a wildlife species to preserve" conducted for the European Hermann’s tortoise program Life+. Animations were organized on this occasion by the ARPE and SOPTOM - Tortoise Village, two partners of Life project. Note the presence Saturday of a third partner in the Life project: CEN PACA with documentation on the Hermann’s tortoise and insects. 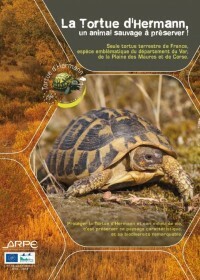 Hermann’s tortoise is invited to the celebration of nature in 2013 in Aix-en-Provence, come and discover! From 23 to 25 May 2013, Hermann’s Tortoise part to the 2013 edition of the festival of nature in Aix-en-Provence (Park St. Mitre, Av Jean Monnet), whose theme this year is "Small animals & Company." You can find the exhibition "The Hermann’s Tortoise, a wildlife species to preserve" conducted for the European program Life+ Hermann’s Tortoise. Animations and workshops will be organized on this occasion by the ARPE and SOPTOM tortoise Village, both partners of Life project. A first phase of openings habitat took place during the autumn-winter 2011-2012 on the property Conservatoire du Littoral in Plaine des Maures. These openings mosaic made ​​on a surface of 118 hectares followed this year by opening the second stage started in February 2013. These openings environments mosaic are made this year on nearly 33ha and will improve the habitat structure of the Hermann’s tortoise through said manual clearings (made ​​using brushcutters wound). The structural pattern mosaic of vegetation optimize the interfaces between open circles and closed circles. It is very important for the daily or seasonal life cycle of the species. In total, more than 150 hectares of bush have been slashing into the scheme on the Conservatoire du Littoral site in Plaine des Maures through the LIFE program. Life interventions on the Bois du Rouquan (Vidauban) start ! Forestry work to improve the habitat of the Hermann’s tortoise in the Bois du Rouquan (communal forest Vidauban) began. The habitat of the Hermann’s tortoise carried on the Bois du Rouquan consists of interventions opening through scrub brush and cuts from pine plantations. They are performed to optimize the interfaces between open areas and closed environments (openings mosaic). These interventions will be as favorable to the Hermann’s tortoise, but also to many other animal and plant species at issue. The Bois du Rouquan is a site with very high ecological value located in the National Natural Reserve of the Plaine des Maures (RNNPM). 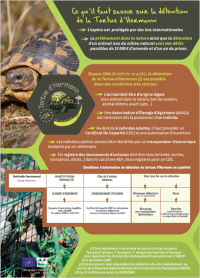 The work is implemented here in the framework of the European program LIFE Hermann’s Tortoise (LIFE08NAT/F/000475) and supervised by the CEN PACA. The new Life Hermann’s tortoise website is online! The official website of Life program is now available! Central communication tool of the Life project, you can find basic information on the Hermann’s tortoise and the implementation of the program. All documents and media produced in the Life will be available directly on the site. Do not hesitate to come back visit often! "Hermann’s tortoise, a protected wild animal"